I liked this con a lot. In fact I suffered a rush of blood to the head and paid for the next three worldcons. I stayed at the Wyndham Hotel, which turned out to be about 12 minutes walk from the Convention Center. I was a bit nervous about walking home at night, but it seemed safe enough. On the other hand, when it rained I got wet! I went to register on Wednesday, a bit early, and I had forgotten my ID (which I probably didn't need), so I went 'home' for it. The program guides were late, but arrived later. Registration was straightforward. Some things took a while to get up and running. The Internet seemed to only get started at 11pm, a bit later than the advertised 2pm. The list for the voodoo board wasn't there at the start, when it was probably useful. But these were minor. On the first day there was a short notice about changes to the timetable. There were no notices on subsequent days. Panels were on where and when the program booklet said. 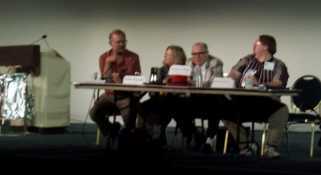 On occasion there were bonuses, such as Alan Dean Foster appearing on a panel unannounced. (I haven't read much of his lately, but I enjoy his writing). I liked the space in the dealers' room. There was a huge gap between tables. On the other hand, the amount of space *outside* the dealers' room was overlarge. The bid tables sat in lonely isolation, and the art show was a bit widespread. But it was handy for the Junk Wars and 1,000,000 Wizard march. I thought the opening and closing ceremonies were somewhat perfunctory, but maybe that's the norm. We all have our preferences for what to do at conventions, and I am a panel-attender. I enjoy a good browse in the Dealers' Room, but that takes at most a couple of hours. In an overseas convention I am not going to be buying up big, because I have to carry it all home. I enjoy sitting around and listening to or joining in the gossip in the Con Suite, but I can't stay at parties. They are just walls of sound. I like to talk, but I can never hear, and I don't like crowds. There was a fair representation of comics in the panels. I suppose they are fantasy. All that I went to were interesting, but not crowded. There was one I did not bother to stay at, on the Legion of Superheroes, that had a good crowd. Its focus was too specific for me. The children's literacy threads were well attended, especially when they had a general theme, such as what happened to the Tom Swift type of novel, which was focused on technology. Mostly they were in tiny rooms, which were comfortably full, away from the main area. So, let's look at the convention generally, then at some of the panels. Actually there are four pages of panels, so you can go separately to two, three or four if you so desire! At the end, there was a panel on stage featuring all the guests, just before the closing ceremonies. Greg Bear, Esther Friesner, George Scithers and Gardner Dozois.